Noida Fortune Propmart Pvt. Ltd. Assured Gift on every booking!! The striking elevation of Saya Zion, with a dome, is uniquely designed and executed by Saya Buildcon Consortium, offers high rising, two sides open, well ventilated remarkable structure. The impeccable project is tactically located at one of the recognized destination of NCR, Greater Noida West. Saya Zion has 2BHK, 3BHK and 4BHK alluring apartments and commercial space with incredible surrounding and contemporary lifestyle. The project offers extravagant features to make the living elite and urbane. Saya Zion, search for dream home ends here!!! Saya Homes started by a self-motivated entrepreneur, Mr. Vikas Bhasin, the prominent group signifies prized contentment of a dream home for many. Saya Homes, a liable and responsible developer give timely possession of the project, adhering to quality and design with their pioneering structure. The unmitigated determination the organization has, distinguished and escalated their customer clientele and made them a role model for many in the industry. 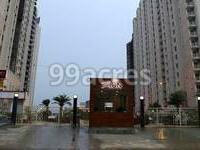 What is the project location?The project is located at Sector-4 Gr Noida, Greater Noida. What apartment sizes are available in Saya Zion? The project offers apartments sized between 1045.0 sqft and 1825.0 sqft. 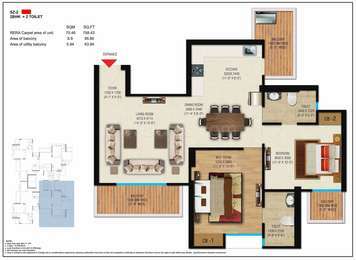 What is size of 2 bhk in Saya Zion? The area of 2 BHK apartments ranges from 1045.0 sqft to 1220.0 sqft. What is the 3 bedroom size in Saya Zion? The area of 3BHK units in the project varies from 1340.0 sqft to 1660.0 sqft. What is the 4 bedroom size in Saya Zion? 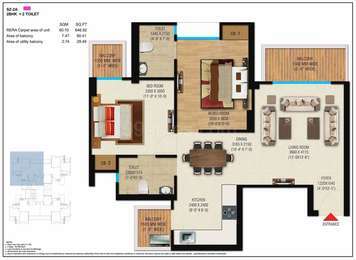 Four-room units (4BHK) in the project are available in an area of 1825.0 sqft. What is total size of Saya Zion?The project is built over an area of 5.25 Acres. Internal Wall : Blockwork / Brickwork, plastered,POP punning, Plastic emulsion plastic paint ( Make : ICI Dulux / Asian / Berger or Equivalent). External Balcony Door : UPVC door frame size : 55mm x 55mm. UPVC Two track Sliding Doors with 5 mm thick plain glass , sliding both sides. Door : Door Masonry Opening :900mm ( w ) x 2400 mm ( h ). Door frame - Meranti Wood. Door frame size: 115 mm x 60 mm section. Door frame ht. : 2400 mm. Flush Door size : 800 mm x 2350 mm and 32 mm thick both side laminated. Accessories- 8 inch Mortice Lock. Door frame : Meranti Wood. Door frame size : 115 mm x 60 mm section. Door frame ht. : 2400 mm. Flush Door size - 800 mm x 2350 mm and 32 mm thick both side laminated. Door - Door Masonry Opening :750mm ( w ) x 2400 mm ( h ). Door frame - Meranti Wood. Door frame size : 115 mm x 60 mm section. Door frame ht. : 2400 mm. Flush Door size - 650 mm x 2350 mm and 32 mm thick. Laminated one side and internal side finish with enamel paint. Accessories -Tower bolt 150 mm, handle with latch. Ventilator - Masonry opening : 400mm x750 mm. Ventilator : UPVC 300 mm openable with 5 mm thick plain glass and 300 mm for provision of exhaust. Internal Wall - Wall tiles (300x450) upto 2400 mm. Main Door - Door Masonry Opening :1050 mm ( w ) x 2400 mm ( h ). Door frame - Meranti Wood. Door frame size : 140 mm x 60/58 mm section. Door frame ht. : 2400 mm. Flush Door size - 950 mm x 2350 mm and 35 mm thick both side laminated. Accessories- 10 inch Stainless steel Mortice Lock and 8 inch tower bolt. External Balcony Door -UPVC door frame size: 55mm x 55mm. Door ht. : 2400 mm. UPVC Two track Sliding Doors with 5 mm thick plain glass, both side sliding. Fire Fighting - Sprinkler, smoke/heat detector in each flat. Make: Newage , Hd, Tycon or Equivalent. Backed with a decade of experience Saya Buildcon Consortium is a leading real estate development firm operating in Delhi NCR. At Saya builders, quality is blended in every of their initiative and there is a confluence of the latest technology with design which shows in their architecturally superior residential and commercial projects. The reason why the company puts this much effort into building these projects is to maintain a long term and amicable relationship with their consumers, and to influence the customer?s life in a positive manner. The company works on the philosophy of integrity, transparency, and innovation. In another big for a real estate company, Saya Buildcon Consortium keeps in mind its responsibility towards environment conservation and societal development and therefore uses energy saving construction material and techniques in its projects. I am keen to buy property in Saya Zion. I want to know the life in & around the project site, Noida Extension area. What about the connectivity in this area?